Have you ever read a history book or a travelogue about an area and the author didn’t provide a map? I have, and it’s very frustrating. So you can be sure there will be lots of maps in my book about Pogamasing. I was also fortunate to locate maps beyond the Pogamasing region and I found them to be highly informative not just to give information on the location of places, but for what they tell you about what was known at the time the map was made. Here is a map drawn by a French map maker, Nicholas Sanson, geographer to the French king, Louis XIII. 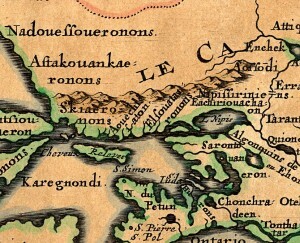 This map was made in 1656, about forty years after the more famous one by Samuel de Champlain of his exploratory trip to Georgian Bay. This map caught my eye because of what it says about the North Shore area of Georgian Bay. 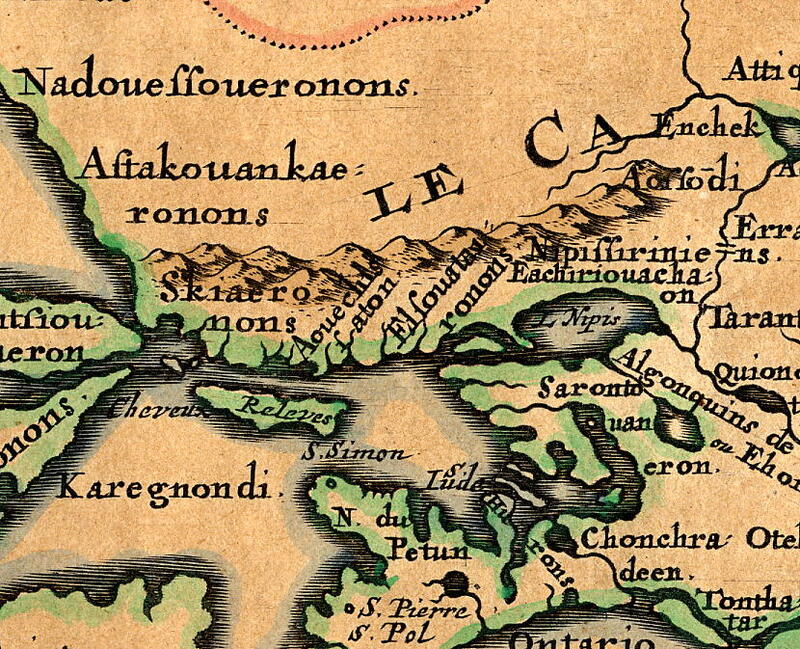 There are names of rivers, which appear to be attempts by the French to write the Anishnabe names. At one point the Spanish River was known as Tortue, definitely a French name.The land north of the coast line, however, was ‘terre inconnue’ to the French. 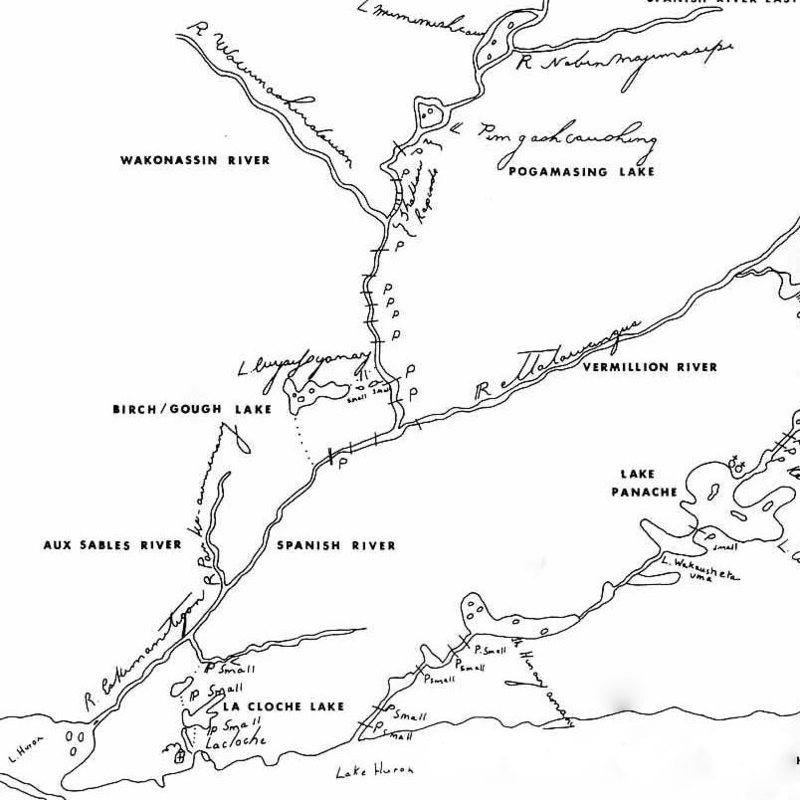 The next most interesting map to me was that drawn by John McBean, the chief factor of the Lake Huron District of the Hudson’s Bay Company. 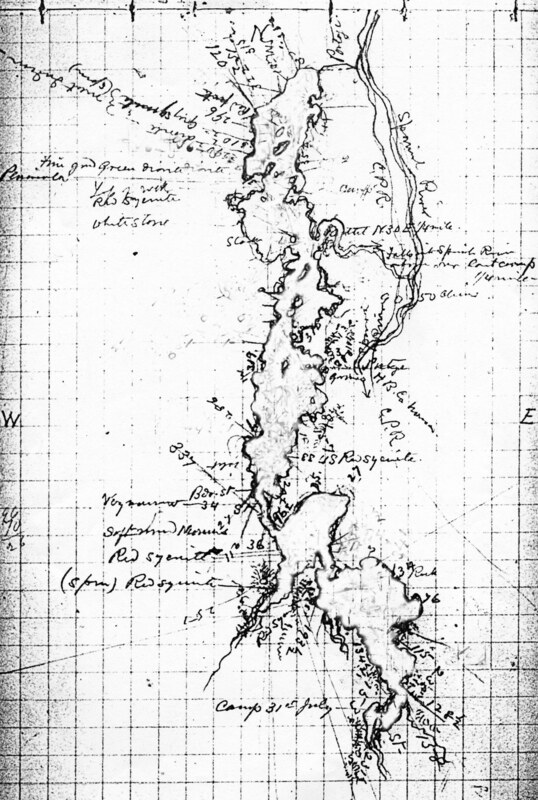 His headquarters were situated at La Cloche about ten miles east of the Spanish River. This map fills in much that was missing in Sanson’s map. McBean got the information from the Anishnabe hunters who were clients of his post. He also used the names that the Anishnabe used. This was unusual because many European map makers named places in English or French. McBean’s map of the North Shore includes the hinterland with the rivers and lakes that we know today. 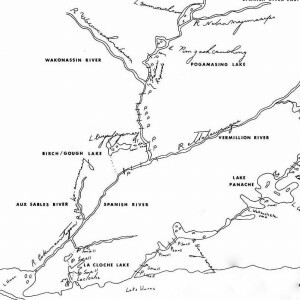 By the late 19th century the surveyors arrived and began to map the rivers and lakes of the area. 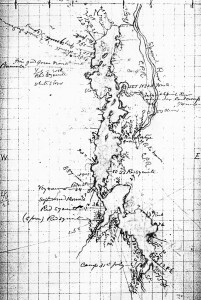 The best example I found was a map drawn by geological surveyor, Robert Bell, who made this map of Pogamasing in 1899. Considering he drew it in a day and a half from a canoe, it is an amazingingly accurate. There are many more maps like this that I’ve found and will be illustrated in Pogamasing: The Story of a Northern Lake. Really enjoying your blogs!! Keep them up! My Adopted Mother (Virginia Aubin) was born April 14, 1888 at Pogamasing. She was baptized by Rev. R. Caron, a Jesuit Missionary. Her Godparents were Arthur Malenfant & Marie Boule. Her Father was Odilon Aubin – he was born in St. Luc, Quebec on March 13, 1859 and came West in 1881 on C.P.R. construction work. He remained in the employ of the C.P.R. until 1900 as section foreman at many different places on the main line between Mattawa and Dalton. He left the services of the C.P.R. in 1900 and came to Sudbury in the employ of the Algoma Eastern. He was promoted to roadmaster and held this position until his death on October 1, 1927. I have a Timetable of: Algoma Central and Hudson Bay Railway Passenger Train Service effective January 17th, 1916 – Short Line between Sault Ste. Marie and the West. It seems to have been put out by H. J. Herrold, General Freight & Passenger Agent, Sault Ste. Marie, Ont. The other side of this Timetable is a map of The Algoma Central & Hudson Bay Railway and The Algoma Eastern Railway. I also have a photograph of the Pogamasing Station showing my Grandparents standing in front with three of their children. Also, I have 2 photographs of Straight Lake Station on the C.P.R. – one dated June 20, 1898. If you would like, I could send you copies of the above. Congratulation on your Book! I would love a copy of your book.I would love a copy of your book .Odilon aubin was my grandfather. Go to my website and see where or how to purchase it.